Just What is Vision Processing? One is gathering skills while the other is processing skills. Gathering is bring information into the brain. Processing is what the brain does with the information to make it useful.. Both gathering and processing skills have an impact on learning. Yet, the processing skills, not really emphasized until 1988 with the work of Dr.Ken Gibson, have a vastly larger impact on learning. Gathering skills may reduce grades only one level, say from an A to a B. Meanwhile processing skills can mean a drop from an A to an F.
Neither gathering or processing skills have anything to do with intelligence. Albert Einstein had vision processing difficulty. Also the Dartmouth study in the 30"s found the best students had the worst eyesight..Why then do these vision conditions result in bad grades? It's because these skills are required to perform in the classroom. The gathering skill of accommodation (ability to shift focus from near to far) is required to look from the white board to the paper on the desk. The processing skill of reversal frequency is required to determine if it is ab or a d. Gathering tracking skills are required to scan a line in a book while the processing skill of visualization is needed to form a picture of the story in the book. Gathering binocular vision skills keep the eyes aligned on the math problem while the processing skill of logic and reasoning determines which number is higher or lower. In each case the intelligence is able. The information in its journey to the brain or its distribution about the brain causes the interference and gives the false impression of a lack of intelligence. A young child was labeled mentally defective and thought unteachable. After treatment by developmental optometrist Dr. Lyons he eventually became an architect in San Francisco. .
5. tracking (moving eyes across a printed page). 13. divergence excess(staring out in space). 3. Visual memory The ability to store and retrieve visual information. 4. Sustained concentration The ability to maintain a visual task without distractions. 9. Visual - motor integration The ability to combine visual input with other sensory or past inputs. What is our VIP program and what is Vision Information Processing? BRIGHT EAGER AND STILL A POOR STUDENT! But Corey’s real problem is not a lack of ability. He, and thousands like him, do not lack ability; he lacks VISION. Oh, he may have perfect eyesight, but his VISION is impaired. The difference is critical. If you have a Corey in your family call us. We’ll explain the difference to you. Eyesight is merely the basic ability to see; vision is the ability to identify, interpret, comprehend, and act on what is seen. One’s eyesight may test normal or standard eye charts, yet visual skills may be seriously impaired. Therefore, normal eyesight may not necessarily produce normal vision because human vision is a complex system of several learned skills which must work together to function properly. Diagnosis and treatment of these problems requires the expertise of skilled professionals. Our VIP (Vision Improvement Program) is an intensive way to strengthen learned visual skills. We train the eyes to function properly within the entire learning system as intended. CAN A CHILD RECOGNIZE VISION - RELATED PROBLEMS? Young children know only what they see, not what they are supposed to see. Naturally, they think everyone else perceives the world as they do. To a child like Corey, this is disastrous. He is doing so poorly in school that his parents are at a loss as to what to do. They have examined all ordinary and physical and emotional reasons for his behavior because he seems like such a bright, energetic kid at home. WHO CAN RECOGNIZE HIS VISION- RELATED PROBLEMS? But what Corey really needs is a behavioral optometrist. This trained professional would discover that Corey experiences severe eye strain when doing close work for any length of time. Corey thinks he feels discomfort because reading and writing are painful chores, and he wonders how his classmates can sit for long periods and say they actually enjoy school work. He’s beginning to think he’s stupid, and of course, he hates school. Routine vision tests performed by school personnel or by most eye doctors only measure eyesight. They do not include the kind of testing that can find visually related learning problems like Corey’s. It’s pretty difficult to learn when reading and writing are uncomfortable. So, kids like Corey avoid any kind of close work. It’s safe to predict that at age nine, this bright eager child is potentially a drop-out. 1. Unable to sit still, cannot stay on task for any length of time. 2. Very clumsy: poor eye-hand coordination. 3. Alternates use of right and left hand. 4. Does written work very slowly: often fails to complete a task. 5. Has difficulty copying visual material, constantly looks up and down. 6. Holds head very close, inclines head far to one side when reading. 7. Moves entire head instead of eyes when reading. 8. Has trouble with buttons or shoelaces. 9.Is disorganized and frustrated when studying visual information. 10. Makes frequent “careless” errors. If your son or daughter, aged 6 to 15, has one or more of these behaviors, call today to schedule a screening for vision-related learning problems. It could be the most important call you will make during his or her school years. You are a concerned loving parent who would do anything for your child. Making an appointment with us may mean giving your child a chance for success other children enjoy. 1. Rapid, accurate eye movements from point to point, word to word, place to place. 2. Having both eyes work comfortably as a team. 3. Eye-hand coordination, necessary in activities such as writing or sports. 4. Reversals - for example: confusing the words “was” for “saw” or letters “b” for “d”. 5. Using side vision to successfully catch a ball or draw a long straight line without moving the head. 6. Reading comprehension due to interference by poor visual skills. 7. Seeing up close without strain. WHAT IS THE VIP STRATEGY? First, we test and diagnose a child’s visually related learning problems. If a visual handicap exists, a vision therapy program will be developed to meet that child’s special needs. Once enrolled in our intensive Vision Improvement Program, a child will work on specific goals. A professional vision therapist will conduct carefully sequenced activities to strengthen weak areas in order to bring the “vision system” up to par. The time span for therapy is designed to allow each child to achieve maximum results. VISUAL MEMORY The ability to store and retrieve visual information. VISUAL CONCENTRATION The ability to maintain a visual task without distractions. VISUAL INTEGRATION The ability to combine visual input with other sensory or past inputs. MOTOR SPEED AND PRECISION Eye hand coordination. ACUITY DEFECTS Nearsightedness, farsightedness, astigmatism. EYE TEAMING / FOCUSING SKILLS The ability to maintain clear and single vision at distance and near for prolonged periods of time without discomfort or abnormal effort. VISUAL DISCRIMINATION The ability to determine if two shapes, colors, sizes, positions, or distances are the same or different. VISUAL STYLE The evaluation of how a person performs a visual task in terms of accuracy, speed, and energy. If your child is between the ages of 6 and 15 (vision processing is still developing under age 6), call us today to set up an appointment for testing. Any unexplained learning problem is a potential vision related learning problem. When diagnosed early, VIP can significantly improve and often alleviate the problem entirely. Can you afford to pass up this possible explanation of your child’s baffling lack of success in school? Call today. The Williams family with therapist Christiana Schimke. Williams, Alexander, & Christopher play a matching game called Set that helps the boys recognize patterns. The metronomes clicked in a syncopated rhythm, and there was a lot of motion and noise in the room, but the boys were able to focus on their individual tasks. Alexander Williams, 11, tapped his foot to a metronome as he matched numbers on boards in front of him. In the opposite corner of the room, his brother Christopher Williams, 8, concentrated on a colored arrows exercise to the sound of another metronome. These tasks are part of the Vision Improvement Program, which helps children and adults who have vision processing problems -- in other words, they might be able to see clearly, but their brains may not be able to tell what to do next with the information. When Christopher started the program about five weeks ago, he would not sit still. Within his first week of kindergarten, his teacher said he had attention deficit disorder and recommended the drug Ritalin, said his mother, Sarah Williams. She has home schooled her children for years because their teachers would not recognize their vision processing problems. The Williams family with therapist Christiana Schimke. Mr. Williams seated, Mrs. Williams, Alexander, & Christopher play a matching game called Set that helps the boys recognize patterns. She found out about the program through a friend whose daughter had severe dyslexia, and she took Christopher to be tested at Dr. Bill Henshaw's office in Lodi. Dr.Henshaw tests children and adults in seven areas to see if they have difficulty focusing or using both eyes together, or signs of dyslexia or ADD. Williams found out Christopher's eye strain was off the chart, causing him to have trouble focusing and concentrating. Dr.Henshaw, who has been a behavioral optometrist for 35 years, heard about the program and was amazed with the results he had heard. Dr.Henshaw is one of many optometrists and therapists nationwide who have adopted the Vision Improvement Program as an effective form of therapy for those with vision processing problems. "There's been a lot of controversy about how vision relates to learning," Dr.Henshaw said. Dr. Ken Gibson, a specialist in pediatric vision processing, and Keith Gibson, a psychologist, did research and wanted to find out the relationship between vision and learning, and they developed therapy by 1985 to help improve concentration and speed up the learning process. There are two areas of vision: gathering and processing. Gathering problems include nearsightedness, farsightedness, astigmatism, etc. Objects are fuzzy, or a person cannot see where an object is. Many of these problems are due to eye strain. Processing is where the relationship takes place: What do you do once you've got the information you gathered? Vision processing is learned, and new techniques can be learned any time. "When I saw this (VIP), I was amazed," Dr.Henshaw said. The program is not limited to children doing poorly in school, but any adult who is having trouble with dyslexic symptoms or has eye strain. Dr. Henshaw began using VIP late in 1997. He monitored the first 35 patients. Five of them had a wandering eye, and after completing the program, their wandering eye was eliminated. He says the success rate has been high. He has had patients ages 6 to 83. Parents who think their child has dyslexia or attention deficit disorder may be seeing a lookalike of a vision processing problem. The Vision Improvement Program tests seven areas, including fixation speed, selective attention, reversal frequency, visual memory, visualization, logic and form reasoning and visual motor integration. 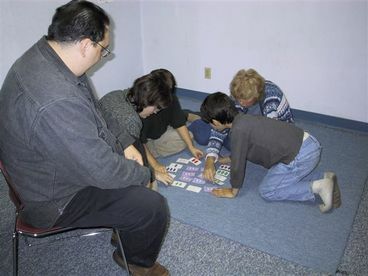 People with problems in these areas might be slow readers, have trouble with directions, work slowly, poor hand-eye coordination and reverse letters such as b, d, q and p. Children are tested in these areas and given an intelligence quotient test to determine what level they are at in comparison with other children in their grade. Some children may be ahead of their years in some areas, such as visual memory, but far behind in areas such as reversal frequency. Dr.Henshaw has a consultation with parents or adults. "I think misunderstanding a child is one of the most unfair things to do," Dr.Henshaw said, adding that children with processing problems often work harder with no reward. He shows a paragraph of what a child might be seeing and has the parents try to read it, which helps them understand their child's problem. He tested both Christopher and Alexander to see a comparison between the two and found that both boys had the same visual processing problem. It was not obvious in Alexander, who had done well in public schools and even skipped a grade. The program includes 30 hours of therapy at the office and 30 hours of practice work at home in the course of 10 weeks. They come in three hours a week for therapy. Three therapists work in Dr.Henshaw's office, including Pat Croft, now retired, who was with the program since its duration. She said even the therapists have increased their learning capability. For much of the therapy, a metronome ticks so that the child can improve processing speed. Many of the procedures include two or more things for the child to focus on at once so that at least one of the things will happen on the subconscious level. One procedure has colored arrows. The first task is to name the colors of the arrows. The next task is to name the direction of the arrows. These seemingly simple tasks can assess how a child looks at things: For example, a child may look at the arrows from right to left or in random order. The next task involves visualization, and the child must name the direction of the arrows at a quarter turn. Each task grows in difficulty. Christopher's favorite part of therapy is the use of the trampoline, and even Croft enjoys working with children on the trampoline. He is asked to do math problems, and with each landing, he must answer. This can improve processing speed. If a child is a slow processor, the jump intervals may help the child increase speed if a child is a fast processor, the jump intervals may slow the processing, which may help a child reduce careless mistakes caused by speed. To improve a child's concentration, office noises are welcomed, and in the case of Christopher and Alexander, both work in the same room at the same time on purpose. It helps them to focus on their individual task as they would have to in a normal noisy classroom. The children have a way of memorizing the presidents in order, forward and backward, with cartoons that link to one another. A picture of a man watching a ton weight about to fall represents Washington. Some may memorize the presidents by the second session while others take weeks or months. When they have the list memorized, they are asked to recite the list in class, and they receive a ruler with the names on it so their teachers have a reference. "Things change differently with each individual," Dr.Henshaw said. "We are but a part of the help. The amount of practice at home makes a difference." Sometimes lens therapy is part of the program. Both Christopher and Alexander use glasses for reading and working up close. With the glasses, Christopher no longer reverses b, d, p and q, Sarah Williams said. Alexander says the best thing about the program is that practice work that took him five hours at first now takes him 10 minutes. And he says his reflexes have improved. The hardest thing for him is calling out arrow signs in opposite directions. "Therapy is fun -- if you get points, you win prizes," he said.Christopher has found the therapy to be helpful as well. "There's better things about me," he said.He finds that puzzle cards are the most challenging, but he has learned better ways to remember information. "They're very intellectual -- both of these kids," Croft said. Both boys are taking ice skating lessons, and Alexander has been learning German at San Joaquin Delta College. The children are assessed after their therapy and a year later to assure that their skills are permanent. In some cases, children's IQs increase because a change in vision processing helps them reach their potential, and they can take tests more easily. Though Alexander and Christopher are only midway through their therapy, their mother can see results. "Alexander has the most steady gain, and Christopher has the biggest jumps in improvement," Williams said. "You would not believe the improvement in Christopher. His tolerance level for frustration has improved. Alexander's penmanship improved, which surprised me." "We are an answer, but we are not the answer," Dr.Henshaw said. "But if we can look at something differently, we might be able to treat it better."